ND2 Miata Versus S2000 - TrackHQ.com, the Web's leading forum for track day enthusiasts, racers and time attack drivers. I feel like there was a discussion here once comparing the ND1 (2016-2018) to S2000 but I couldn't find it after attempting a couple of searches. the ND2 which gets a 25hp bump over the ND1 along with a higher redline should be a pretty good comparison to an AP2. Yes the Miata is still down 50hp or so on the S2k but it also weighs about 500 pounds less and I believe the Miata has better torque. I honestly haven't seen any tests of the ND2 but I'm curious what those here who have experience in the S2k and ND Miata might think. A homecoming 3 decades in the making. 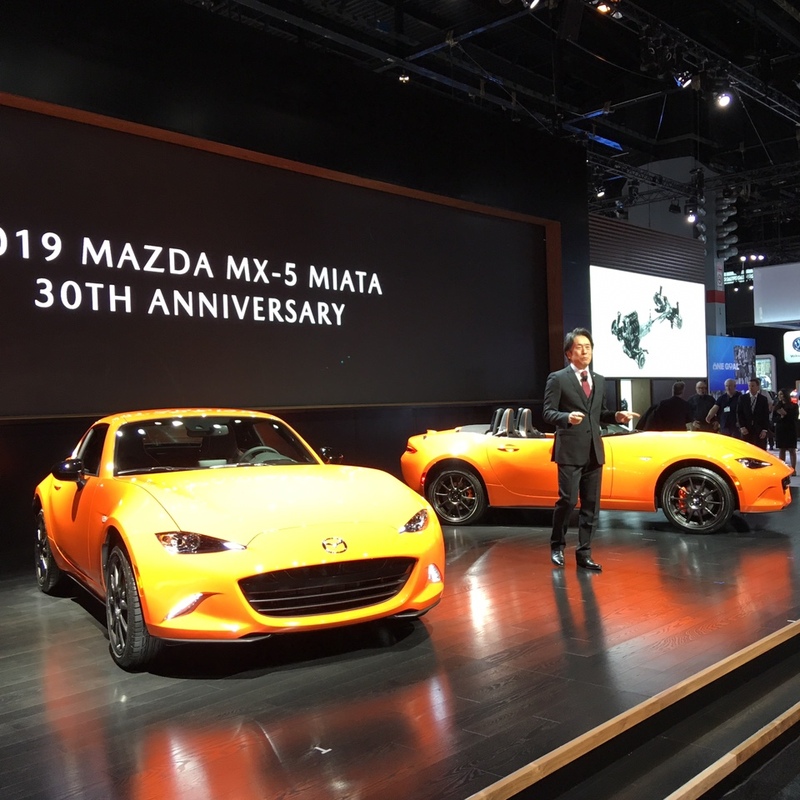 In February of 1989, the Mazda Miata was first introduced at the Chicago International Auto Show. Witness its return to where it all began. Last edited by Red_5; 02-05-2019, 04:30 PM. Here's the pic I was trying to post of Mazda's 949 Racing / SuperMiata 30th Anniversary Edition. Last edited by Red_5; 02-05-2019, 04:36 PM. after driving my son's bone stock FRS and seen Sonny did a 1:58 at CW13 on non-aero FRS (it has an E85 tune, spring, sway bar and R888R). I am convinced FRS will be the next gen FRS. btw, one Sonny drove wasn't close to be dialed in, it was still on stock shocks, handled like crap, still plenty of time left in it. problem with ND, is they are now on v5 transmission (that's the one I know, might of been a v6 or v7 already). it is just too fragile to take it on to a track. You said the FRS will be the new FRS, did you mean the FRS will be the new S2K or new Miata or new FRS? I think I’ve seen that Mazda is at least on version six of the ND transmission. The Fiata used the NC 6 speed which in the second generation on has been reliable. I wonder how difficult it would be to swap the Fiat trans-rear end into an ND? lol...... let me try again.... FRS will be the new s2k and the new ND Miata. there is a good reason you don't see a ton of ND Miata on track. Are there that many FRS at the track? Racing Orange it is! I want one, hopefully they'll continue the color or add something like a modern Mariner Blue. Another shot with better light. Looks like a sweet car with I think orange Brembo front calipers, Recaro seats with orange piping and Rays forged aluminum wheels. All cars will have manual transmissions and limited slip diffs. Agree. And why we bought an FRS as a project car. As Dan said, "they tick all the boxes"
I was wrong, they're only on version 5 of the transmission. At what point do you just shelve the idea and go back to the transmission and rear end from the NC? 86/BRZ is the real deal. Been saying it for a long time and I have a lot of miles in them. They are a great street/track/race car. there is a fix, Long Road Racing built all those ND Cup car. someone told they tear apart all transmissions and replaces some parts on it ? may be that makes it not street friendly? The FRS is a VERY popular HPDE car here in Atlanta. I would say it's easily the second most popular to the Miata. They are very good track cars, but there are a lot of flaws, like any other. The local FRS community share a lot of the common issues the cars have. The TO bearing, strut mounts, ECU and engine problems seem to be the most prevalent. A lot of the early customers on the valve spring recall are experiencing some pretty frightening issues with the dealers not doing the work correctly.